Dennis or Jesus: How Do You Understand Your Relationship with the Father? "When I put my faith in Jesus Christ, I became a child of God, a member of God's family. I will never be kicked out, even though I sin. In human families, children can run away, get in trouble, etc., yet they can never cease to be the children of their parents and members of their families. That is something that can never change! So it is with God's family: I can sin, but I can never cease to be God's child. Who I am - my identity as a child of God - can never change. I am saved and can never lose my salvation. Yet just as a human father will discipline his child, so my Father in heaven will lovingly discipline me when I sin, for my good; but I will never cease to be His child!" This sounds good, doesn't it? Yet it is not correct. Of course, it is true that when we put our faith in Jesus Christ we become the children of God and members of God's family (John 1:12, etc.). It is true that we cannot lose our identity as children of God, nor our membership in God's family, nor our salvation, through sinning (Romans 8:30, 1 John 5:4, etc.). Notice, however, that this common saying entirely neglects the central truth of the Gospel of Christ: the righteousness of God through faith. The Gospel teaches us that when we put our faith in Jesus Christ we become the righteousness of God in Him (2 Cor. 5:21). Through faith in Christ we are justified (declared righteous) and have peace with God (Rom. 5:1). The blood of Christ shed on the cross presents us blameless before the Father (Col. 1:22), perfecting us forever (Heb. 10:14). We are washed from all of our sins, and no accusing tongue can ever lay a charge against us (Rev. 1:5, Rom. 8:33). Believing in Christ does not merely make us members of God's family, but it makes us righteous, which is the divine requirement for being in God's family. The problem with the common saying above, then, is that it too simply compares our relationship to God with our relationship with our human families, as if there were no difference! It fails to take into account that our relationship with God, though similar indeed to our human family relationship, involves something entirely unique and different. It is this critical difference which makes the Gospel something transcendent and amazing, and not just like something else on this earth. This, as I have already said, is the righteousness which we possess through faith in Christ. A child in a human family can get in all sorts of trouble with his parents. He can be a menace. He can be a grief to his parents. 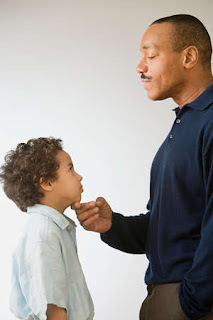 Though he can never cease to be a member of the family, his siblings or friends can tattle-tale on him, and his parents will discipline him for his wrongdoings. They do not see him as perpetually blameless. Consider the case of Dennis the Menace. Though Dennis ever remains the true child of his parents, yet he is constantly getting into trouble and not infrequently receiving spankings from his dad. Is this how our relationship with God works? Let's face it: we all sin. As Christians we behave, from the perspective of God's holy law, like little Dennis the Menaces. Is it truly the case that we are simply saved members of God's family but are not actually seen as righteous in the eyes of our Father? Does God look down upon His children with disapproval, seeing their sin and disciplining them on account of it? If our sins bring a frown to God's face, and we are always falling short, do we therefore believe that God is never smiling on us? If the answer to these questions is "yes", then righteousness by faith has, in effect, no practical bearing. If our case with God is the same as the case of Dennis the Menace with his father, then we are not actually righteous in the sight of God, and the Biblical truth of righteousness through faith essentially just means that I receive a "get-out-of-jail-free card" because I can prove my dad is God; a card in my wallet that I can show the gatekeeper of heaven. He knows and I know that I am not really righteous, but because I can prove I'm in God's family I get my free pass. The righteousness I possess through faith in Christ is a "legal fiction", meaning it legally gets me into heaven, but as for me being actually seen as righteous by God... that is a fiction. Sadly, many Christians think of their relationship with God like this. They think they are menaces in the eyes of God. They know they are saved, will not go to hell, and will never be kicked out of God's family (praise God for all this! ), but they do not live their lives thinking they are actually righteous in the sight of God. They look up and wince every time they sin, believing that God is frowning upon them, ready to discipline them with His big wooden spoon. Righteousness through faith has no practical bearing. It means only a legal pass. As shocking as the Biblical truth of righteousness through faith may sound, the Bible actually teaches that the righteousness which we possess through faith in Christ is no legal fiction. When we put our faith in Jesus Christ we become the children of God precisely because we are declared righteous in the judgment of God. God really does see His children as righteous, lawful, sinless, and perfect. He "has not beheld iniquity in Jacob, neither has He seen perverseness in Israel." (Num. 23:21) "As far as the east is from the west, so far has He removed our transgressions from us." (Ps. 103:12) "In those days and in that time, says the Lord, the iniquity of Israel shall be sought for, and there shall be none; and the sins of Jacob, they shall not be found: for I will pardon them." (Jer. 50:20) "No weapon that is formed against you shall prosper, and every tongue that rises against you in judgment you shall condemn. This is the heritage of the servants of the Lord, and their righteousness is of me, says the Lord." (Is. 54:17) "I will greatly rejoice in the Lord, my soul shall be joyful in my God, for He has clothed me with the garments of salvation, He has covered with the robe of righteousness, as a bridegroom decks himself with ornaments, and as a bride adorns herself with jewels." (Is. 61:10) What amazing things God speaks about His people! This means that we Christians are in an extremely fortunate condition: a situation of blessing in which God does not even count us as sinners! Instead, He counts us as righteous, apart from any works that we do (Rom. 4:6)! John carefully defines sin as lawlessness. Whoever, therefore, is lawless has never known Christ. The purpose Jesus came into the world was to take away our lawlessness by His death on the cross, and therefore whoever believes in Christ is no longer lawless before God. If you were still lawless before God you wouldn't be a Christian. In Christ there is no sin, and we are in Him - therefore, we are in that blessed place of sinlessness, which David was singing about! It is not by being lawful by our works that we are lawful before God. That is impossible. It is by being righteous through faith that we are delivered from lawlessness and have the assurance that we are His children. Every Christian can say that He is sinless in the judgment of God, both now and forevermore, according to John. What a practical difference this would make in our lives if we acknowledged the truth of our true identity as God knows it to be! The apostle Paul long ago said that this is the great secret of victorious living (Rom. 6:11). Can you imagine what a difference it would make if instead of thinking that God sees all of your sins and disciplines you for all of them, you conformed your thinking to God's thinking (Rom. 12:2) and acknowledged that He looks upon you with perfect joy and delight because you are blameless in His sight? Would your days be different if you lived under God's perpetual smile rather than God's perpetual frown? Do you think you would be more, or less, inspired to serve the Lord with gladness if you thought that God declared you to be righteous every moment because of the blood of His Son? You do the math. Praise God that according to the Scriptures, Christians are righteous in God's sight and are blessed with every spiritual blessing! This is how our Father in heaven wants us to understand our relationship with Him through Christ. However, the great objection to this transcendent New Testament truth is, of course, Hebrews chapter 12, verses 5-11. What shall we do with this passage which clearly says that God disciplines His children? In fact, it says that if God doesn't discipline you then you aren't even in His family! No other passage has been so badly misused in shaping the unfortunate 'Dennis the Menace' way of thinking. Hebrews 12:5-11 is so powerful in a bad way because for most us - before we even approach the passage - we are naturally gripped by mere human and non-transcendent ways of thinking. The Biblical idea of righteousness through faith, it must be remembered, is God's wisdom and God's way of thinking, higher than the heavens, that doesn't make sense to the natural mind (Is. 55:9, 1 Cor. 2:14). How on earth can I be counted actually righteous if I am not actually righteous by my works? How "on earth" indeed! But the mystery of Christ is a heavenly truth, a revelation from God in the Gospel. The cross is foolish to the natural man, and it requires the Spirit to understand spiritual things. Yet even we Christians are often gripped by natural ways of thinking, and it is difficult for even us to believe how tremendous our salvation in Christ really is. When we speak about the "unsearchable riches of Christ" (Eph. 3:8), the "unspeakable gift" (2 Cor. 9:15) and the "love of Christ that passes knowledge" (Eph. 3:19), we usually get lost like laymen talking about high-level mathematics. Human beings, Christian or not, are prone to think of spiritual things like natural things, and so when we come upon a passage like Hebrews 12:5-11 we throw our hands up and say, "See! Darn, there it is... my relationship with God is like my relationship with my earthly dad." Let's drop the natural presuppositions and think about the passage in light of the Gospel. When we take the time to do this we will notice things we never considered before. First of all, the context of the passage is all about persecution for righteousness sake. Christians are suffering for their faith and therefore need to be encouraged to persevere through tribulation (Heb. 12:4, 12). Jesus Himself is set forth as an example of suffering for the Christians: "Consider Him who endured from sinners such hostility against Himself, so that you may not grow weary or fainthearted." (Heb. 12:3) In light of the context, then, the Fatherly discipline Christians will endure, because they are the righteous children of God, appears to be persecution. To put it more graphically, God permits non-believers to slaughter the righteous "all the day long" (Rom. 8:36), not because the righteous are being disciplined for their sins, but because God uses suffering to teach His children what their hope is, to the teach them about righteousness and the world's hostility to it, to teach them about His love, in order to show them that they can be more than conquerors through His love (Rom. 8:37), and to teach them that He works all things together for their good (Rom. 8:28). For God's children, the discipline of suffering is entirely about learning to trust in the sovereignty and love of God, learning to rest in the righteousness they have through faith, and learning precisely that they aren't suffering because of their sins, but rather because they are His righteous children. This is the lesson God wants His children to learn. This is what the disciple (or "training", which is a better translation of paideia than"discipline") is all about. Quite the opposite of what is usually thought! Besides considering the context of Hebrews 12:5-11, we also should ask ourselves the most obvious question that seems to have gotten missed in the hasty handling of the passage. That question is this: if being disciplined by the Father proves that you are His son, and therefore every true son is disciplined, while everyone who is not disciplined is proven to be illegitimate and not a son (Heb. 12:8), then was Jesus, the Son of God, disciplined by the Father? It's funny how in all my Christian days I have never heard this question raised before. If we take the common interpretation of "discipline" in Hebrews 12:5-11 - which is that God the Father lovingly spanks all His children for their sins - then we must either say that Jesus was lovingly spanked by the Father for His sins, or that Jesus was not disciplined and therefore is not a son. Of course, no Christian is willing to say either of those things! In light of this problem there are only two remaining options: either Jesus is an exception to the passage, or we may really not understand what the "discipline" in the passage is all about. But the passage speaks emphatically that all sons are disciplined by the Father. There appears to be no exception, nor, in my mind, any need for an exception. Once we understand that the "discipline" in the passage is not spanking but training, then we can see that Jesus too, like David and all the children of God, was disciplined and could likewise say, "Yea, though I walk through the valley of the shadow of death, I will fear no evil: for Thou art with me; Thy rod and Thy staff they comfort me." (Ps. 23:4) God trains His children by bringing them through the valley of the shadow of death, not for their sins, but for righteousness' sake. Earlier in the Book of Hebrews the fact that Christ was trained by the Father is stated explicitly, and the connection with Hebrews 12:5-11 is unmistakable: "Though being a Son, He learned obedience from what He suffered." (Heb. 5:8) Therefore Jesus, the Son of God, was disciplined by the Father! This was not for His sins; and neither is the discipline which we undergo by the Father for our sins either. A further proof of all this is that the Book of Job is quoted two times explicitly, and is alluded to repeatedly, throughout Hebrews 12:5-11 (Job 4:3-5, 5:17, 12:10, 21:7-9). The lesson we learn from the Book of Job is that Job suffered greatly at the hand of God and yet it was not because of his sin. Job was a righteous man and perfect in His generation. In fact, the reason why suffering came upon Job was because He was a righteous man! If we take the position that God disciplines us because of our sins we are taking the side of Job's three unhelpful friends. If we take the position that suffering comes upon the righteous because God wants to teach them to trust in Him, and to bring them forth as gold (Job 23:10, 1 Pet. 1:6-7), then we are taking the side of truth. So yes, God does discipline His children, but not for their sins. The discipline - or better, the training (paideia) - whether it takes the form of persecution or any kind of suffering in general, is meant to train us children to think God's way and to trust in our Father in heaven. As hard as it is to fathom, the Bible amazingly teaches us that when we put our faith in Jesus Christ we are actually counted righteous before God. We are even counted as righteous as Jesus Christ (1 John 3:7), and our relationship with the Father is comparable to His relationship with the Father (John 17:20-23, Rom. 6:9-11)! We are justified through faith, and therefore God never sees us any other way than as justified. We are not under any law, rule or obligation that would bring upon us spankings if we failed to live up to it (Rom. 6:14). We can have the utmost confidence that even when we go through suffering it is not because God is spanking us for our sins. In fact, we can only triumph through our trials when we know that they are not spankings. The knowledge of God's delight in us and the truth that we are beyond the reach of all accusation enables us to face each trial with confidence and joy. So how do you understand your relationship with God and your membership in God's family? When you put your faith in Christ did you merely become a member of His family, or did you become righteous through faith? Is the righteousness you possess through faith a legal fiction, which will keep you out of hell but has no current practical bearing? Or does God actually see you as blameless in Christ right now? Does God count your sins and frown on you throughout the day, or is He not counting, delighting in you all day long? Do you think your relationship with God is like Dennis the Menace's relationship with his parents, or like Jesus Christ's relationship with the Father? Which way does God want you to think? The following is an answer to a question regarding judgment passages such as Matthew 16:27 and Revelation 22:12. I couldn't find anything that I had specifically written on this subject, but I have a sermon on the sheep and the goats that touches near the issue. The most important thing we need to keep in mind is that God's judgment is all about righteousness. It is not about God judging us for our good deeds with our bad deeds, giving us some good back for the good we've done and giving us some bad back for the bad we've done depending on the proportion of each. That is how most people tend to think the judgment will be, but in reality no one will get five cookies and three coals from God, so to speak. It's all or nothing, because righteousness is all or nothing (Deut. 6:5, 25, 12:32; Gal. 3:10; James 2:10). Those who have "done good" are the righteous, and those who have "done evil" are the unrighteous. There is no in-between. Whenever Jesus describes this day, it always has to do with the "righteous" and the "unrighteous" (Matt. 13:37-43, 47-50, 25:31-46). There will not be a judgment where a man stands before God and is given a mixed recompense. A person either does good or does bad. There are no other options. In the eyes of the world, could John, Jesus and Paul have been more ambiguous? Have you "done good"? How do we judge that? It seems so general! We can see immediately that if we understand good and evil in the way they are commonly understood we are at a loss, because everyone, according to the common understanding, does a mixture of good and evil. What is goodness? What is evil? What does the passage mean by these? Without the Biblical truth of righteousness we are at a loss. Through the gospel we understand that good and evil have everything to do with righteousness. A man does good when he is righteous, and does evil when he is unrighteous. However, no one does good (Rom. 3:12). There are none righteous, not even one (Rom. 3:10). So how will any pass the judgment? How will God resurrect the righteous if there are none? Yet the Scriptures also state that there are righteous people, who are born of God, and therefore that "do good". We reconcile this apparent contradiction (and it is an apparent contradiction) by pointing to that righteousness from God which is given to us through faith in Christ. We are not righteous by obedience to the law, but are counted righteous through faith in Jesus Christ, and therefore attain to the resurrection of the righteous. Clothed with this righteousness, the Judge will judge us as righteous on that day. In this way believers have done good. This is the language of Genesis 4:7: "If you do well, will you not be accepted? But if you do not well..." What is it to "do well" in context but to do what righteous Abel did? That was to believe (Heb. 11:4). The Bible uses the language of "doing good" or "doing righteousness" (ex. Gen. 18:19, Is. 64:5, 1 John 2:29, 3:7, 10). We know that righteousness is moral perfection, but how do we do it? How do we become righteous, and thus live on judgment day? It is not through the doing of the law, but through faith in Christ that we "do righteousness". Believing is something we "do", just like resting is something we do, though the nature of what we do determines that it is not a work (see Is Faith a Work?). What do we do? We "do truth" (John 3:21, 1 John 1:6): that is, we agree with God concerning our unrighteousness, and agree with God concerning the testimony of His Son. We "do the will of the Father" (Matt. 7:21, 12:50): because we believe in His Son as He commands us to believe. "What must I do to be saved?" is a perfectly acceptable question. "Believe in the Lord Jesus Christ and you shall be saved" Paul said (Acts 16:30-31). Believing is what we do, and by doing it we do the will of the Father, we do the truth, we do righteousness, we do good. By believing we show that we are born of God. So I--, whenever I read those passages I read them with righteousness in view. God will indeed judge men according to what they have done. Let us remember that His standard is righteousness. Those who haven't believed will be found unrighteous and punished for their sins. Those who have believed will be found to be blameless in God's sight, and will be declared the one's who have done good. The wonder of it all is that we are sinners ourselves, and our righteousness is not our own. If we don't see the judgment this way, we will, at best, always be in doubt about our standing on judgment day. Actually, if judgment depends upon our works in a general sense, then we shouldn't even be in doubt, but rather be in despair. If God judges me based upon my works and gives me what I deserve, I am a lost man. There is no way to have peace except by lowering the standards, but this is impermissible. Except by fooling myself that my good deeds outweigh by bad, or that the punishment for my bad deeds isn't going to be that bad will I obtain some semblance of peace. But this is not how God judges. His judgment is based upon righteousness; righteousness is moral perfection; and the punishment is severe because of the serious nature of sin. There is simply no other way to Biblically understand judgment day. The final issue that needs to be addressed is the issue of reward. Many of those judgment passages say that Christ will "reward every man according to what he has done." (Matt. 16:27, Rev. 22:12) As Christians we get hung up on this word (and with good reason), because if salvation is a gift of grace, how can Jesus be referring to salvation in these sayings, since they state that He will be doling out rewards? Many Christians therefore conclude that these sayings have nothing to do with salvation, but rather with non-salvific heavenly rewards. While I don't deny the reality of such rewards, I do not believe that these sayings are referring to them. They are referring to salvation or damnation (2 Cor. 5:10-11). But how then can salvation be a reward? It is a good question, but there is a not-too-difficult answer. First, the English word "reward" is not always the best translation of the Greek word apodidomi. The word can mean several different things, the main idea being "to deliver". It can mean to reward/recompense, or to give away what is yours, or to give back, or to sell, or to give what is promised. The last, "to give what is promised", is helpful, for God has promised blessing for the righteous and punishment for the unrighteous. When Christ returns He will give what He has promised to every man according to what they have done. But though this softens the word some, it still does not wholly answer the dilemma. We know that sin deserves death. Does righteousness therefore deserve life? Yes it does. Just as death is the appropriate thing for God to give a sinner, life is the appropriate thing for God to give a just man. God is just in giving death to sinners, and God is just in giving life to the righteous. In fact, He must give to each what is just or cease to be just. Therefore, in this sense the righteous indeed await the bestowal of that life which is rightfully theirs. We can say that life is the reward of righteousness. However, our righteousness is a gift and not something we worked for, and so therefore the life that accompanies that righteousness is also a gift and not something we worked for. I only possess life because of the grace of Christ. I can also say that I possess life because of righteousness. As Paul said, eternal life is a free gift from God (Rom. 6:23) because it is "through Jesus Christ our Lord" who provided righteousness for sinners by His death. Therefore we can see how God will reward every man according to what he has done, whether good or evil, and that this is consistent with the gospel. We don't need to go outside of the gospel to understand this saying. One final passage from Paul: "I have fought a good fight, I have finished my course, I have kept the faith: henceforth there is laid up for me a crown of righteousness, which the Lord, the righteous judge, shall give [Grk. 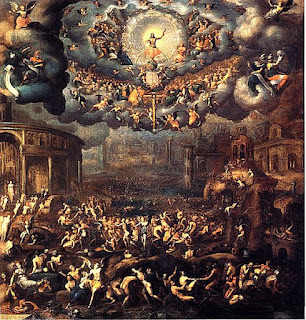 apodidomi] me at that day: and not to me only, but unto all them also that love his appearing." (2 Tim. 4:7-8) Here we see Paul's conception of his own salvation and the judgment which Jesus spoke of. The Righteous Judge, Christ, who judges in righteousness, will "give" (and the word is the same one translated "reward") Paul the crown of righteousness (which I take to mean life, the manifest glory which is given to the righteous and declares that they are righteous) on that day. It is the reward of righteousness, but there is no doubt in Paul's mind that it is a gift. Our crowns will simply be trophies for the glory of God, as we Christians sing so often. And it is with this message of the gospel that we need to encourage our flocks. It isn't by salvific nor non-salvific rewards and punishments merited by our works that we will rightly motivate people to say no to ungodliness and worldly lusts, but by the inspiration which arises by the sight and experience of the grace of God (Titus 2:11-15, 3:1-8). This is a lesson the Church needs to learn. Hope this provides some helpful food for thought.